Credit: Courtesy of BFI National Archive. Photographs by Barbara Flueckiger. Film: [Francita] [no further information available]. 1 Watkins, Liz (2013): Interview. Giovanna Fossati. In: Simon Brown, Sarah Street and Liz Watkins (eds. ): British Colour Cinema. Practices and Theories. Hampshire: Palgrave Macmillan, pp. 228–235, on pp. 229–235. “Operated in Gt. Britain by British Realita Syndicate Ltd. (See also Société de Films en Couleurs Naturelles Francita). A normal contact black-and-white print is made from the negative and projected, as usual, with processes of this type, by means of a split triple objective embodying the additive primary colour filters. Means are provided for independent registration of each image upon the screen. A feature film was made in France by the Francita process and it was exhibited in July 1935 with considerable success at a Parisian cinema. The colour was very fine indeed in parts of the film, and any defects were due to poor lighting rather than to the process. This film proved that were it not for the serious commercial problem of a special projection apparatus, with the likelihood of its getting out of adjustment, the subtractive processes would have a serious competitor in additive systems of this type. Considering that the positive part images are of sub-standard dimensions it is remarkable how good the definition is. A limited amount of fringing was perceptible in close-ups. Films of the Coronation of H. M. George VI and “Trooping the Colour” were exhibited in London at the Cameo Theatre and elsewhere in 1937 with considerable success. Slight fringing is occasionally apparent. The brightness of the projected picture is rather poor, as must inevitably be the case with additive processes. These films were also shown in France, Belgium and Holland. “Another collection of early colour material recently acquired by the BFI National Archive poses a different series of problems. 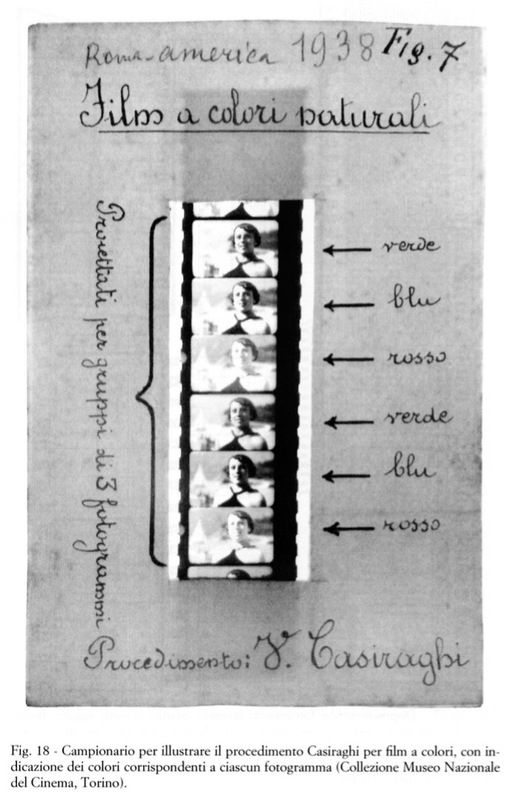 In 1935 Armeno Secci invented an additive colour system for Francita, Société de Films en Couleurs Naturelles in France. At least two French features, Jeunes filles à marier (1935) and La terre qui meurt (1936), were made with this process, both by Jean Vallée, but the process failed to take off. The patent was later bought and introduced in Britain in 1936 first under the name Opticolor and later British Realita. This additive system uses standard 35 mm panchromatic film, but records three small colour separations on each frame reduced to roughly the size of a 16 mm image in order to accommodate the three within a single frame. Two pictures, corresponding to the red and green information, are taken simultaneously before the film is moved half a frame and the third image (the blue) is taken. The colour is photographically recorded through a rotating disk located behind the two lenses (one for the red/green and one for the blue) and fitted with coloured filters. Once a single black-and-white positive copy was made from the negative it could be used in any standard 35 mm projector running at 24 fps, although a special lens containing the required colour filters had to be fitted in order to optically superimpose the three images on the screen. Contemporary press reports in Kinematograph Weekly considered the colour to be very good. Seeking to photograph images in realist tones, ‘the colours ranged from the lightest of pastel tints to strong but not too vivid colours’ (Anon. 1937: 53). The process was also apparently capable of a good contrast range, capturing distinctly different shades of white while boasting glossy black. However, certain reservations were formulated at the time with regards to sharpness and brightness, problems common to all additive colour systems. A large amount of light was required during projection to obtain good results, something that would have fluctuated from one theatre to another. The projection lens, which had to be rented along with the films, required a skilled projectionist or the slightest misalignment would blur the image. Looking at one frame, one can spot three potentially problematic factors. First of all, there is a slight parallax between the red and green frames, which occurs when two images are taken at a slightly different perspective making them out of kilter. Also, as one of the two images is photographed via a mirror while the other is imprinted directly through the lens, one image appears a lot less sharp than the other. Finally, the slight time lapse occurring between the exposure of both red and green images and the blue one means that a perfect alignment of three images, particularly with fast-moving objects, is impossible. At the time the Francita system was introduced, Dufaycolor was the main additive colour process exploited in Britain. An expensive and technically challenging system itself, it nonetheless had the advantage of being projectable without any accessories like lenses or colour wheels, and at a standard speed. Ten years after Claude Friese-Greene’s own attempt at commercial success, it was even more risky for a system like Francita to have any chance of breakthrough when developments in subtractive colour systems such as Gasparcolor and of course three-strip Technicolor were already producing notable results.8 One could argue that the two latter systems were more appropriate for fantasy and animation and that there was therefore a market for a more realistic photography for actualities. This may help explain the use of the name British Realita and the subjects chosen for their productions. Until 1936, the Paris-based company Francita were sole holders of the process’s patents. Presented to him as a business opportunity, Sir Thomas Bazley invested money in a British branch, Opticolor Ltd, and took a place on the Board of Directors, despite seeming to know little, if anything, about the film business.9 The principle aim of the investment was to produce films within the British Empire. It is possible that the opportunity of the 1937 Coronation was an impetus in acquiring the system since the event was likely to have widespread appeal across the British colonies. Financial difficulties arose almost as soon as Opticolor Ltd was created and a long series of disputes and court orders among the main investors brought the company’s activities to a halt. British Realita was subsequently created in 1937 with Sir Tomas Bazley as exclusive owner of the company. However, the whole business was still dependant on the French company to provide equipment and technical guidance. Continuous financial quarrels and a strained relationship with the French (who were themselves struggling to keep the business afloat) contributed to the process never reaching its already limited potential. By 1939, complicated by the international political situation, the company had lost most of its staff and offices, and to prevent liquidation began to look at alternative subtractive processes. The BFI received the films of the British venture in 2005 from the Bazley family. There were 69 cans representing seven complete titles and various incomplete elements and test reels. The material included finished prints, original negatives, foreign language tracks and unedited sequences from projects that were seemingly never completed. The films had been untouched since the demise of the process and had remained at the family estate ever since. The cans were extremely rusty, though some still bore the address labels for the news theatres they were to be sent to in 1937. The majority of the films, however, were in relatively fair condition, although extremely dirty and shrunken. 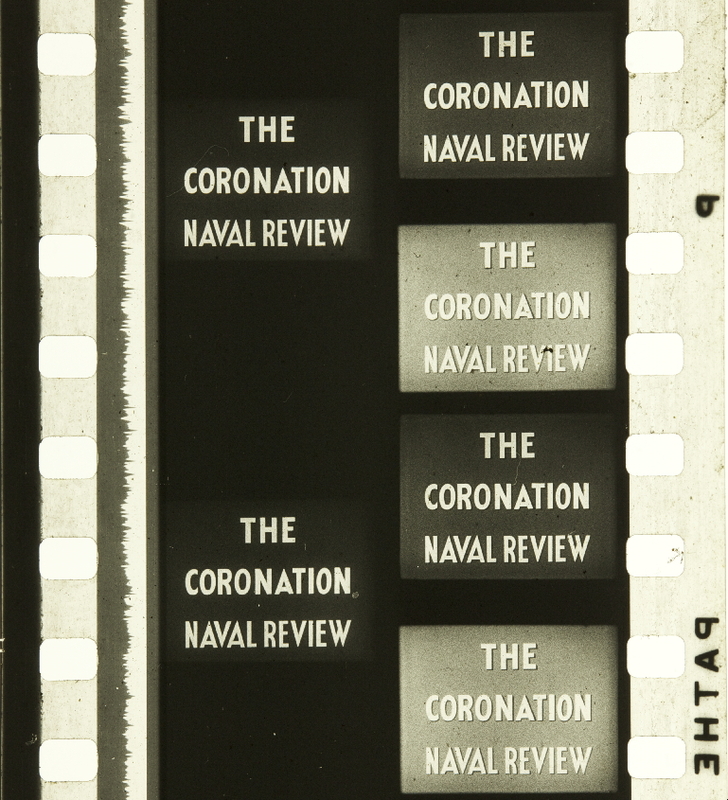 The seven complete films received cover the main newsworthy political events of the period: The Coronation of Their Majesties King George VI and Queen Elizabeth, The Coronation Naval Review, RAF Display at Hendon are examples. There is also footage relating to a horse race, probably the Derby, but no finished version of it. 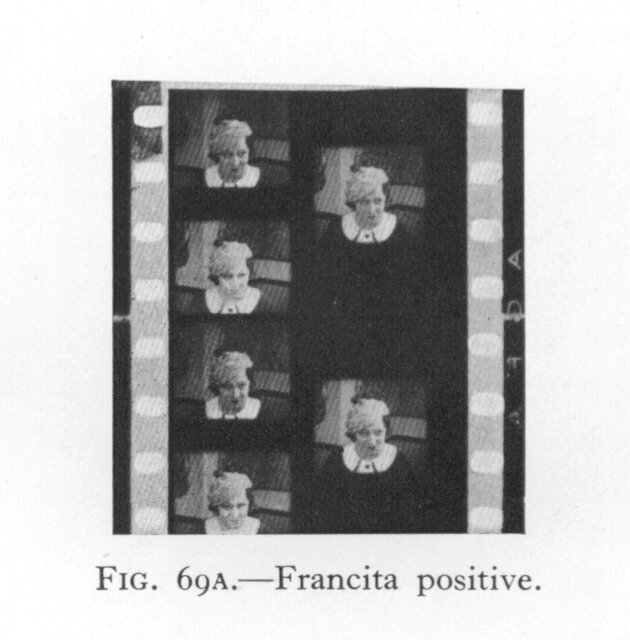 The story of Francita’s failed introduction in Britain is no doubt fascinating to researchers of early colour film and the film business in the mid-1930s, but the BFI National Archive faces some difficult questions in deciding whether to commit to the investment required to make the contents of these films available. First, the limited available evidence uncovered so far suggests that these films were little seen beyond demonstrations to the industry and screenings in a handful of news theatres around central London, and since the events were filmed by other companies using different processes, the footage is not unique. Secondly, as archivists with responsibility of care for an enormous national collection, it is important to balance cultural value with the considerable cost of restoring the films and the likely authenticity of the results. 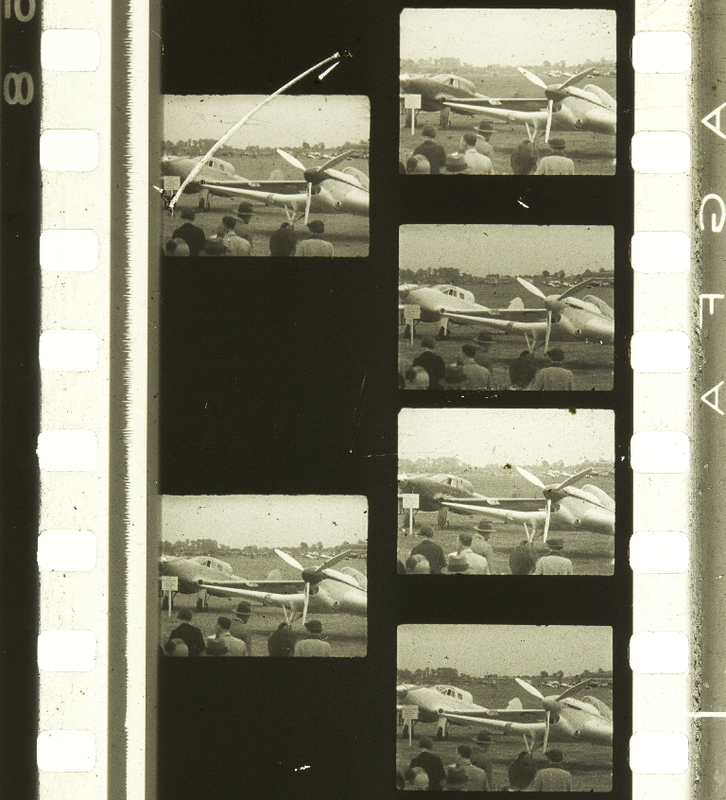 It would be possible to restore the footage photochemically, as the Service des Archives du Film du Centre National de la Cinématographie did for the French film La terre qui meurt in 1995. Digital methods might also be tried but the results will always be haphazard, as we do not hold a reference for the original colour balance. Digital means might give us greater flexibility but are not miraculous; they will never restore what is essentially missing. 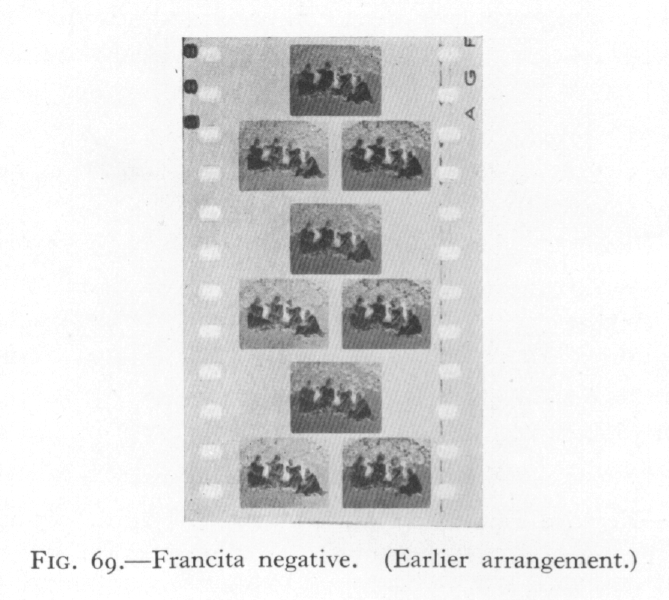 Unlike The Open Road project, which despite technological hurdles had very evident cultural value, the surviving Francita footage, a failed, relatively unknown, footnote in the history of additive colour processes, is unlikely to attract funding and remains passively preserved but inaccessible in the BFI National Archive vaults. It is likely to remain so for the foreseeable future. In conclusion, growing public and academic interest in early colour films presents both an opportunity and a dilemma for film archives, as indicated by the three case studies above. The higher costs involved in preserving and making available the original colour tones of large numbers of early films, has meant that the vast majority have historically only been seen in black and white. Even in the exceptional cases where the colour has been recreated on viewing prints it is only rarely, usually only for the highest-profile restorations, that the time and money is available to produce as faithfully as possible a rendition of the original colour tones – usually by recreating the techniques originally used in making the film. Because of this our understanding and experience of early film is distorted. This is understandable, as a truly authentic viewing experience of a film from the past is impossible. However, it is important for researchers working in early film to understand how their viewing experience differs from those of original audiences. In relation to early colour film, this involves knowledge not just of the techniques used when the film was originally made. They must also understand the preservation and restoration processes undertaken by film archives which make today’s viewing copies accessible. It is also true that archives need to listen to the opinions and needs of academic institutions when making their preservation and restoration decisions. 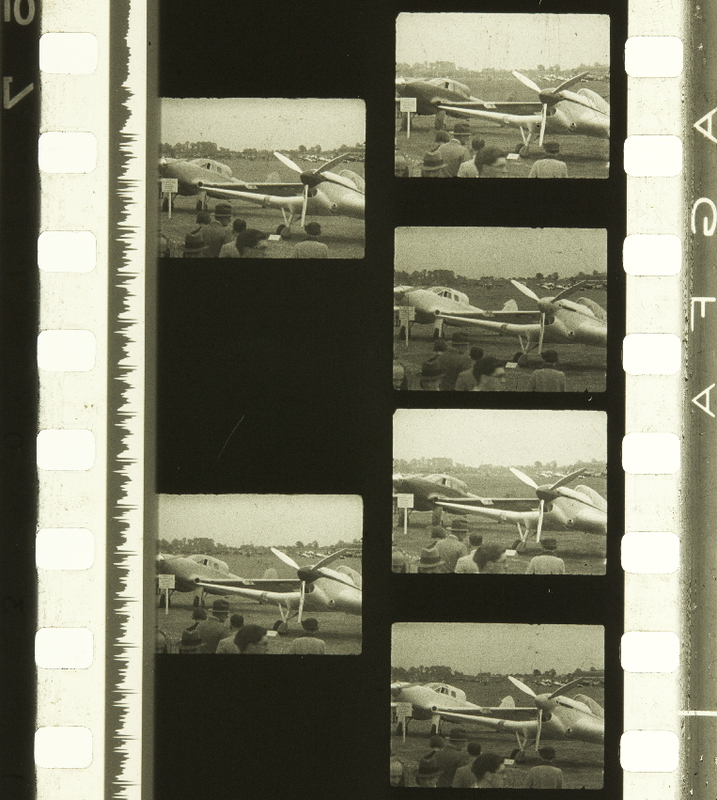 Should the BFI National Archive be concentrating their budgets on making larger quantities of film available for research in a ‘compromised’ form – for example, a black-and-white print of an originally tinted film – or in producing a smaller number of high-quality prints in full colour? Years of experience of photochemical restorations and the recent rapid advances of digital imaging technology mean that new prints of early colour films can be released of a quality and vibrancy rarely seen before. Such developments have a real potential to garner new levels of interest and attraction to such films, reinvigorating the appreciation of early cinema. The danger of these advances is that it is possible to bring elements out of these films that have literally never been seen before, prompting real ethical dilemmas for archivists. Such issues are already being considered through restoration case studies being undertaken at the BFI, such as the work on the Joye collection. The archiving community as a whole is already having such ethical discussions through its peer organisations, publications and conferences. It is time for academics to voice their opinions and express their needs for furthering the study and understanding of such materials in order to continue the debate. 8Additive systems tended to rely on special equipment such as lenses and colour filters. Because of these, stronger light sources were required during the projection in order to obtain a satisfactory image. 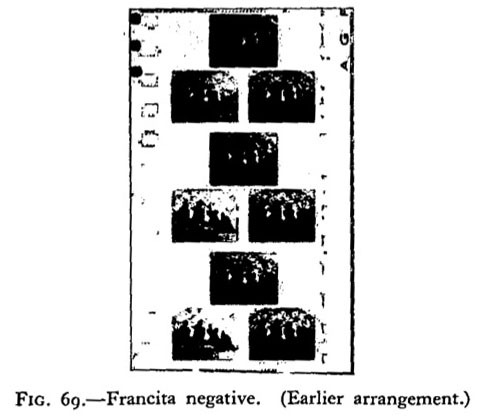 For a few years in the 1930s the French Francita process was marketed in the UK, first by Opticolor Ltd and then by the British Realita Syndicate Ltd, so that reports in the British trade press refer to the process both as Opticolor and Realita. They are, in fact, the same. 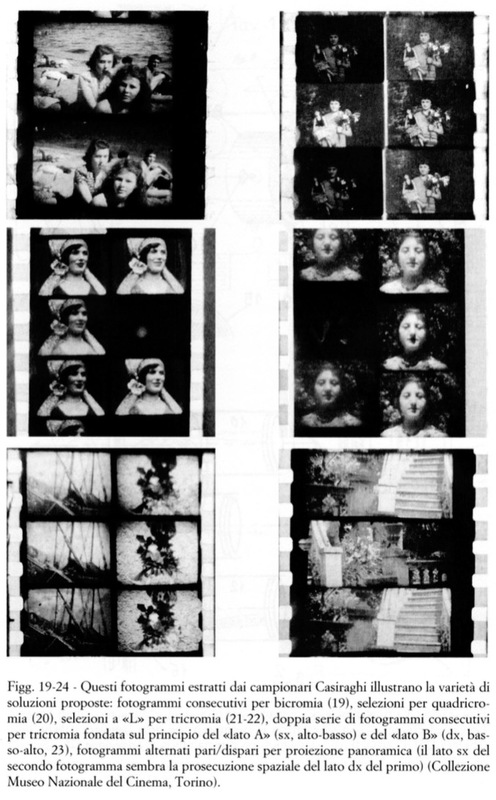 The process was developed in France by Maurice Velle, initially starting out by registering three small images within a normal film frame, one above the other two in a pyramid shape. 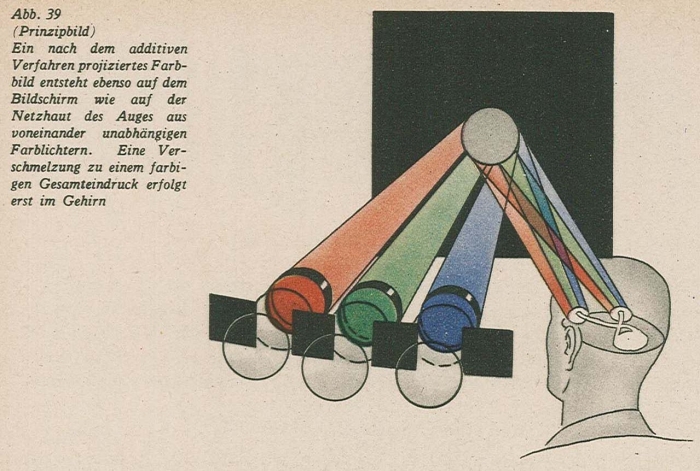 This version was first demonstrated in 1931 but by 1933, when it was demonstrated as Opticolor in the USA, it had undergone revisions based on patents submitted by Jean Marie Guttman and Pierre Angenieux. The system now registered small-sized images representing the red and green records diagonally across the film frame, after which the film was wound on half a frame and the blue record was registered in the remaining empty space, resulting in a frame with two records on the left-hand side of the frame one above the other, and one on the right. This system meant that the process required only two lenses for a three-colour image. The pictures were taken at 48fps. 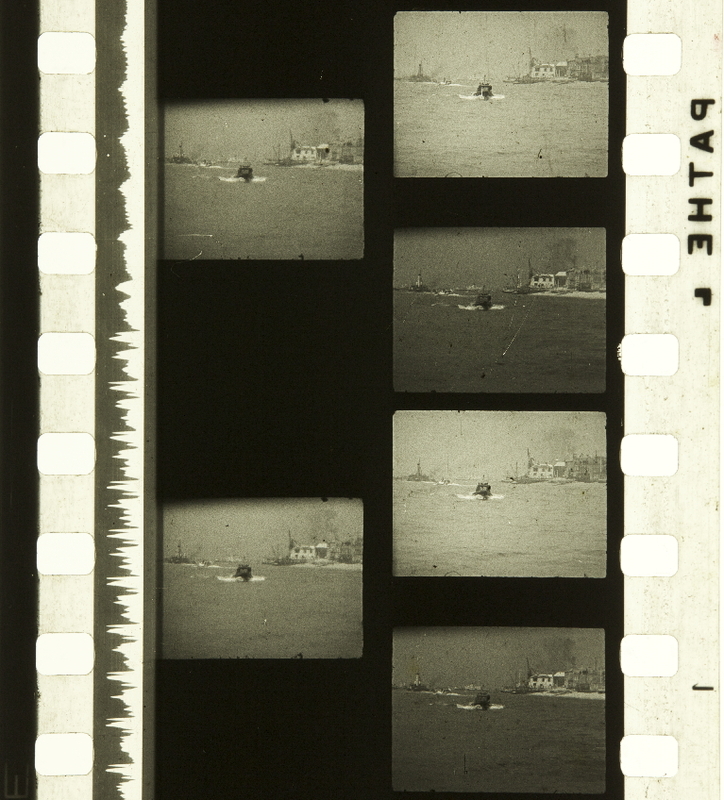 A black-and-white print was then made from the negative and projected through a corresponding series of filters mounted in an adjustable mechanism which allowed for the three images to be moved into registration on the screen. Precise registration was impossible because the blue record was registered a fraction later than the red and green records. While the process enjoyed some modest success in France, being used for the only two colour feature films released in France before World War II, Jeunes Filles à Marier (1935) and La Terre qui Meurt (1936), in Britain the exploitation of the process was prevented by a complex and fractious period of development. The French Francita company was formed in 1932 with a capital of 4 million francs and in 1934 acquired the patent rights excluding certain territories, among them Britain. Francita formed the Société Realita in 1933 to acquire the rights to the remaining territories. In 1936 the British rights were granted to Opticolor Ltd, formed by Mary Murillo. Murillo had become interested in the process in early 1935 and in January 1936 signed an agreement with Société Realita to acquire the UK licence by forming a company with capital of £1 million by November. However, the investors which she had lined up pulled out after a disastrous demonstration of the process, leaving Murillo in need of short-term capital to make interim payments of £1,000 per month to Realita, which she persuaded businessman Sir Thomas Bazley to cover. Murillo claimed that Realita had delivered faulty lenses for the demonstration, and in July 1936 she refused to continue the payments. Bazley inspected both the books and the process and decided that the process was viable but that Opticolor as a business was not, and so resigned from the board and set up British Realita Syndicate to take on the rights. While technical development proceeded, including working with Vintens to produce new lenses, the company was unable to go into full-scale commercial development because Murillo and Opticolor refused to accept that they were in breach of their contract. The grounds were that Opticolor had defaulted on its payments, but Murillo argued that this was because Société Realita had defaulted on their agreement to supply the correct lenses. With British Realita unable to confirm sole ownership of the rights to the process, they were unable to attract investors. Limited production nevertheless took place in 1937. The first film was of the Coronation procession of King George VI. In a major coup, British Realita managed to get the film processed in time to screen it that same afternoon in the Cameo News Cinema in London. While this was a great achievement, the film was not widely distributed because most British cinemas did not have the mechanism required for projection. The film was shown in Manchester, Bristol and Birmingham, but received much wider distribution outside the UK in Holland, Belgium and Canada, where the Francita system was more established and more cinemas had the necessary equipment. The publicity surrounding the speedy projection of the Coronation film was, however, sufficient to encourage cinema owners to invest and within days orders for the projection mechanism were coming in from the UK, while the Italian rights to the process were also sold. Realita immediately announced it was filming the Naval Review, the Trooping of the Colour and the Aldershot Tattoo. These projects were successful enough to encourage the company in June 1937 to make their first studio film about a collection of rare masks from 200BC to the present day, photographed by John Odle, the company’s chief technician and managing director. 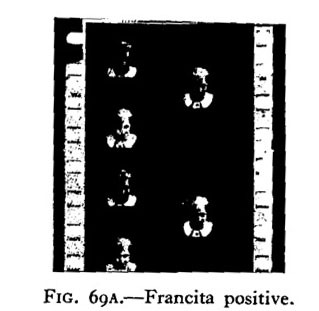 Despite considerable pressure from British Realita, Société Realita did not pursue a resolution regarding the Opticolor situation. Having already paid out around £40,000, British Realita refused to pay more until the situation was resolved to the satisfaction of potential investors, meaning that by May 1938 British Realita still had not received a licence from France. Furthermore, Thomas Bazley was approached by two separate individuals offering the chance to buy a controlling interest in Société Realita, and discovered that neither individual was aware of the other, strongly suggesting serious problems in France. With almost no capital, no licence and little prospect of getting one, 1938 saw British Realita selling off its assets and closing its offices. John Odle and British Realita’s other technician, the American Lars Moen, abandoned Realita and went to Belgium to develop a process which they called Truecolor. Hopes were raised in 1939 when William Fox agreed to meet Moen and Bazley in Paris to discuss the possibility of using Truecolor/Realita, having previously been involved with Chemicolor. The prospect of war, however, caused him to cancel his trip, while the invasion of Belgium by Germany at the outbreak of the war caused Moen to close down his lab in Belgium, effectively signalling the end of British Realita. Francita in France continued in business after the war, attempting to develop a subtractive process under the Francita/Realita banner. Cornwell-Clyne, Adrian, Colour Cinematography (London: Chapman & Hall, 3rd edn, 1951), pp. 279-80. Crisp, Colin G., The Classic French Cinema 1930-1960 (Bloomington: Indiana University Press, 1993), p. 136. 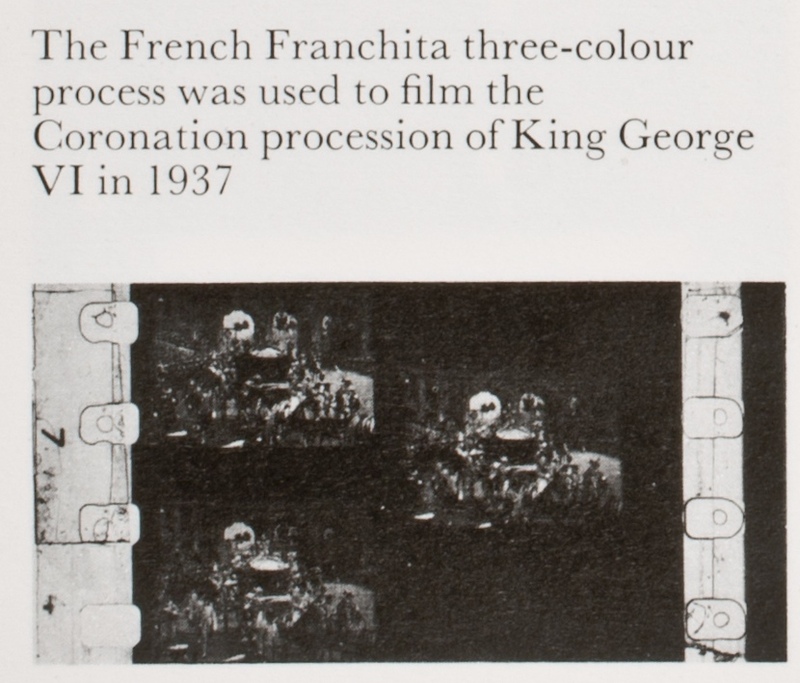 Dixon, Bryony and Genaitay, Sonia, ‘Early Colour Film Restoration at the BFI National Archive’, Journal of British Cinema and Television vol. 7 no. 1, April 2010, pp. 131-46. Thomas Bazley Collection Gloucestershire Archives, D540/48 to D 540/59. Today’s Cinema, 2 June 1937, p. xi. Im ersten Hauptteil dieses Buches haben wir uns mit der Physik des Lichtes und der Psychologie des Farbsehens beschäftigt. Nunmehr gehen wir einen Schritt weiter und wenden uns den Verfahren zu, auf denen die Photographie in natürlichen Farben und somit auch der Farbfilm beruht. Im Laufe der vergangenen Jahrzehnte ist eine schier unübersehbare Fülle von Vorschlägen ausgearbeitet und wieder verworfen worden, die auch nur dem Namen nach lückenlos aufzuzeichnen ein mühseliges und dabei unnützes Unternehmen wäre. 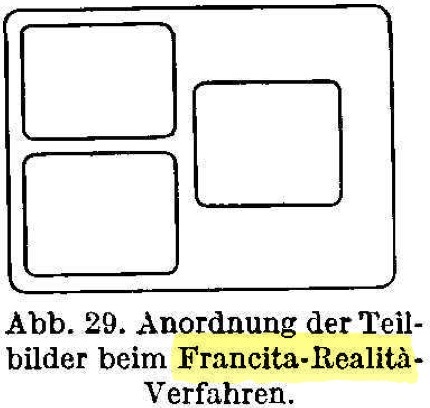 Wir ziehen vor, nach Klarstellung der farbenphotographischen Grundlagen zunächst in die Unzahl der Vorschläge eine systematische Ordnung zu bringen, bevor wir uns der Besprechung der hauptsächlichen Verfahren zuwenden. Wenn wir uns vor die Aufgabe gestellt denken, wir müssten erstmalig die Farbenphotographie erfinden, so würden uns der Erste Hauptteil dieses Buches den Fingerzeig für die beiden möglichen Methoden geben: dort ist einmal ausgeführt, daß man durch Übereinanderprojizieren roten, grünen und blauen Lichtes auf einem Schirm jede beliebige Lichtfarbe erhält, wenn man die Stärke der Farblichter entsprechend im Verhältnis zueinander regelt (Abb. 39). Wir erweitern dies nun dahingehend (Abb. 40), daß wir die Regelung der Stärke der Farblichter durch geeignete photographische Silberbilder vornehmen, über deren Herstellung wir später hören werden. Wir erfinden aber auch gleich noch die andere mögliche Methode, zu Farbbildern zu gelangen (Abb. 41): Wenn es uns gelingt, ein geeignetes purpurfarbenes, gelbes und blaugrünes Farbstoffbild herzustellen, brauchen wir diese nur hintereinander zu schalten und auf die Leinwand zu projizieren. Die erste – additive – und die zweite – subtraktive – Methode ist in den Abbildungen an einem einfachen Beispiel, einem gelben Kreuz auf bläulichem Grund, erläutert. Ohne daß uns damit die praktische Arbeitsweise der Farbenphotographie bereits bekannt wäre, haben wir doch induktiv abgeleitet, daß die Voraussetzung jedes naturfarbig projizierten Bildes das Vorhandensein von drei Teilbildern ist, die bei additiver Wiedergabe schwarzweiße Silberbilder, bei subtraktiver Wiedergabe aber Farbstoffbilder sein müssen. 3. die Wiedergabemaßnahmen, durch die das farbige Projektionsbild erhalten wird. Man muß sich ganz klar machen, daß Aufnahme und Wiedergabe durchaus selbständige und voneinander unabhängige Prozesse sind, und daß es sehr wohl möglich ist und sogar vorteilhaft sein kann, den Aufnahmeprozeß des Verfahrens A mit dem Wiedergabeprozeß der Verfahren B, C oder D zu kombinieren. Hiernach richtet sich dann die Gestaltung des Verarbeitungsprozesses. Machen wir eine normale photographische Schwarzweißaufnahme, so entwirft das Objektiv unserer Kamera zu jedem Zeitpunkt nur ein einziges Bild auf dem Film. Bei Farbaufnahmen müssen wir indessen gleichzeitig drei Aufnahmen erhalten. 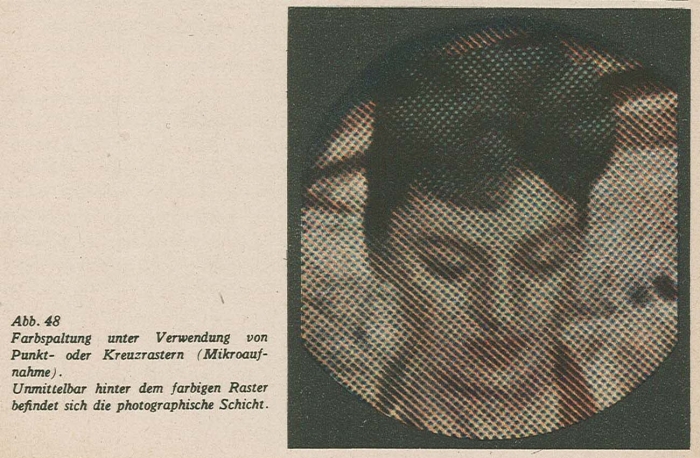 Diese Aufnahmen müssen in allen Teilen untereinander identisch sein, bis auf die verschiedene photographische Umsetzung der Farbwerte der Objekte. Diese Farbauszüge lassen sich entweder nach der Methode der Farbspaltung (Abb. 42), der Farbsiebung (Abb. 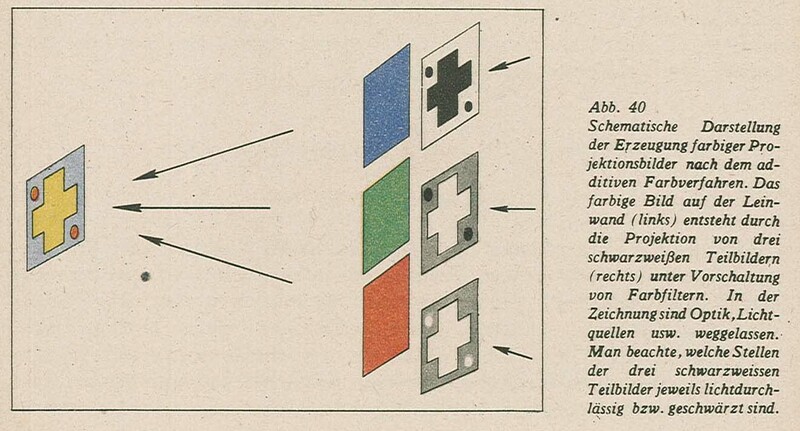 43) oder nach verschiedenartigen Kombinationen aus Farbspaltung und -siebung erhalten (Abb. 44). Von Farbspaltung sprechen wir, wenn durch besondere optische Zusatzeinrichtungen hinter dem Aufnahmeobjektiv die Farbauszüge nebeneinander auf drei oder auf zwei Filmen oder auf einem einzigen Film entworfen werden. Bei Farbsiebung sind die drei Aufnahmeschichten hintereinander angeordnet, und zwar entweder auf drei oder zwei oder einem einzigen Film. Unter diesen Gesichtspunkten läßt sich eine aufschlußreiche Systematik aller Möglichkeiten der Farbaufnahme entwickeln (Abb. 45). Man erkennt so den Zusammenhang der historisch oder gegenwärtig wichtigen Farbverfahren untereinander und bemerkt auch, daß nicht alle theoretisch möglichen Kombinationen bisher praktisch ausgeführt wurden. Die Unterteilung in die Spalten 3 Filme, 2 Filme und 1 Film, die in der Kamera laufen, ergibt unmittelbar wichtige Rückschlüsse auf die Handhabung des Aufnahmeverfahrens. Nur die in der Spalte “1 Film” aufgeführten Verfahren können die vom Schwarzweißfilm her vorhandenen Aufnahmeapparate verwenden, während alle andern Verfahren Spezialkameratypen benötigen. Die in der rechten oberen Ecke der Tabelle Abb. 45 aufgeführten Verfahren haben zwar das gemeinsame systematische Merkmal dreimaliger Farbspaltung bei Verwendung eines einzigen Films in der Kamera, indessen sind sie so heterogener Natur, daß es zweckmäßig ist, die hier bestehenden technischen Abarten im folgenden noch einmal besonders zu betrachten. Methode 1 ist verhältnismäßig trivial, sie verlangt die Verwendung eines Strahlenteilungsobjektivs bei der Aufnahme; meistens werden drei Bildchen etwa von Schmalfilmgröße auf dem Normalfilmbildfeld neben- und untereinander angeordnet. Methode 2 und 3 schachteln die Farbauszüge mikroskopisch fein streifen- bzw. punktweise ineinander; mit welchen Mitteln dies geschieht, werden wir noch erfahren. Auch die Wiedergabeverfahren lassen sich durch eine systematische Betrachtungsweise übersichtlicher machen. Während bei der Aufnahme ein bis drei Filme gleichzeitig laufen, dient zur Wiedergabe immer nur ein einziger Film; anders wäre eine Vorführung praktisch schwierig durchzuführen. Der Wiedergabefilm trägt die drei Farbauszüge, und zwar entweder hintereinander oder nebeneinander (Tabelle Abb. 49). Man vermag leicht einzusehen, daß die Nebeneinanderordnung der Farbauszüge die Umkehrung der Farbspaltung bei der Aufnahme ist, und daß man das farbige Projektionsbild in diesem Falle durch die additive Farblichtmischung erhält. Sind die Farbauszüge hintereinander auf dem Wiedergabefilm angeordnet, derart also, daß das Projektionslicht nacheinander die drei Farbauszüge durchsetzt, so bedeutet das subtraktive Farbbilderzeugung. Als äußerliches Unterscheidungsmerkmal kann dabei noch bewertet werden, ob die drei Farbauszüge alle auf der gleichen Seite des Films untergebracht sind, oder ob z. B. die eine Seite zwei, die andere einen Farbauszug trägt. Die Tabelle Abb. 49 gibt ferner an, woraus das Bild besteht: aus Silber oder aus photographisch erzeugten Farbstoffen oder aus photochemisch gedruckten Farbstoffen. Der erstgenannte Fall beschränkt sich auf die additive Wiedergabe, die beiden anderen bedeuten subtraktive Wiedergabe. Das Ziel des Aufnahmeprozesses ist, die drei Farbauszüge herzustellen; das Ziel des Wiedergabeprozesses ist, die drei Farbauszüge wieder zu einem naturgetreuen projizierten Farbbild zu verschmelzen. Die Aufnahme-Farbauszüge erfahren nun verschiedene umfangreiche und umständliche photographische und photochemische Umwandlungen bis sie als Wiedergabe-Farbauszüge für die Projektion geeignet sind; d. h., daß sich zwischen Aufnahme und Wiedergabe ein von der Kopieranstalt zu leistender Verarbeitungsprozeß einschiebt, von dessen technischer Gestaltung und sorgfältigen Durchführung der Erfolg eines Farbverfahrens im hohen Maße abhängt. Üblicherweise ist in unserer Vorstellung der Aufnahme- und Wiedergabeprozeß bei jedem Farbfilmverfahren eine zusammengehörende Einheit. Indessen ist dies nicht berechtigt; wir können jedes Aufnahmeverfahren aus Tabelle Abb. 45 mit jedem Wiedergabeverfahren aus Tabelle Abb. 49 kombinieren, indem wir den Verarbeitungsprozeß entsprechend leiten. Selbstverständlich ist nicht jede Kombination empfehlenswert und technisch vertretbar, dennoch zeigt diese Betrachtungsweise besonders deutlich die engen Zusammenhänge der Farbfilmverfahren untereinander. Wir werden an diesen Gedankengang eine vergleichende Betrachtung der wichtigsten Farbfilmverfahren anschließen, sobald wir sie im nächsten Abschnitt in ihren Grundzügen kennengelernt haben. 3. 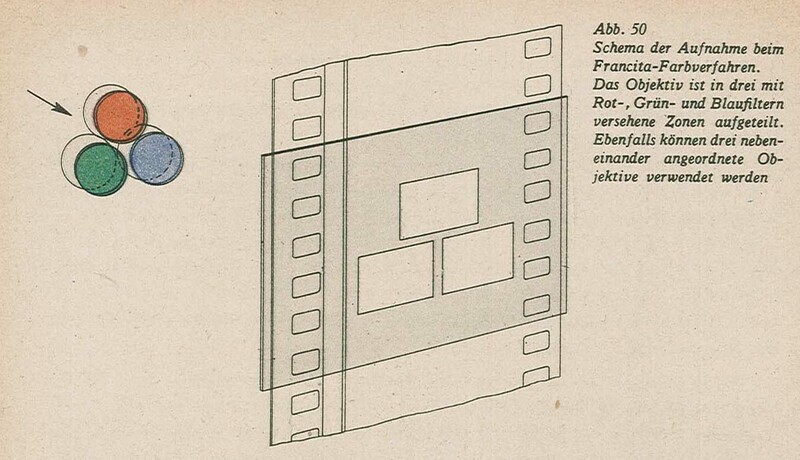 Deckungsfehler, d. h. farbige Konturen, besonders an den Bildrändern, teils wegen optischer Fehler der Teilbildlinsen, teils wegen der ungleichmäßigen Schrumpfung der Filme, durch die die relative Lage der Teilbildchen zueinander in wechselndem Maße geändert wird. Eine überschlägig durchgeführte kurze Rechnung soll uns zeigen, warum wir von diesem Verfahren keine Bilder erwarten dürfen, die zuverlässig von Deckungsfehlern frei sind. Wir nehmen an, daß wir ein auf eine 8 Meter breite Leinwand aus 40 Meter Abstand projiziertes Bild aus 20 Meter Entfernung betrachten. Das Auflösungsvermögen des Auges wollen wir nur mit zwei Bogenminuten ansetzen (tatsächlich ist es noch größer); das bedeutet hier, daß zwei Bildkonturen, die etwa 1,2 cm auseinander liegen, noch getrennt wahrgenommen werden. Unter den vorausgesetzten Projektionsverhältnissen genügt bereits eine relative gegenseitige Versetzung der Teilbildchen um 0,015 mm um einen in der Projektion erkennbaren Deckungsfehler erkennen zu lassen. Die Filmschrumpfung allein bewirkt jedoch bereits relative Versetzungen von 0,04 mm, wenn Schrumpfungen bis zu 0,4% angenommen werden. Dazu kommen noch Bildfeldwölbungen in den Bildfenstern von Aufnahmeapparat und Wiedergabeprojektor, optische Linsenfehler sowie Dejustierungen der Teilbildlinsen bei Aufnahme und Wiedergabe, wodurch die Fehler in der Konturendeckung vervielfacht werden. Bemerkenswert ist auch die überaus geringe Bildwandhelligkeit der Farbverfahren vom Francita-Typ. Sie ist einmal auf die früher bereits angeführten physikalischen Gründe zurückzuführen, die aber hier durch das winzige Format der Farbauszugbilder noch verschärft werden. An Stelle einer exakten optischen Ableitung der auftretenden Lichtverluste sei nur darauf hingewiesen, daß niemand von der Projektion eines Schmalfilms auf die riesige Wand eines großen Filmtheaters ein gleich helles und auch sonst mit einer Normalfilmprojektion gleichwertiges Bild erwarten wird. Die Filmbildgröße der Farbverfahren vom Francita-Typ entspricht aber der des Schmalfilms, so daß die entsprechenden Qualitätseinbußen unvermeidlich sind. Es schien uns notwendig, auf diesen Typ von Farbfilmverfahren etwas genauer einzugehen. Das bestechende Moment der Einfachheit verführt immer wieder Erfinder dazu, auf diese Karte zu setzen; die prompt eintretenden oben erläuterten Fehler werden dann als leicht überwindbare Anfangsschwierigkeiten angesehen, während doch eine sorgfältige Durchrechnung der zulässigen Toleranzen für Linsenfehler, Justagefehler und Filmschrumpfung sowie eine Berechnung der erzielbaren Bildwandhelligkeit über die Grenzen des Verfahrens sofort Aufschluß geben würde. Auch dieses Verfahren verwendet dreifache Farbspaltung für die Aufnahme und additive Wiedergabe. In Abb. 51 ist es schematisch dargestellt. Von den Verfahren vom Typ Francita unterscheidet es sich dadurch, daß die drei Farbauszüge nicht als vollständige kleine Bildchen getrennt nebeneinander angeordnet sind; hier wird jeder Farbauszug vielmehr in mikroskopisch feine Streifen aufgeteilt und mit den andern ebenso aufgeteilten Farbauszügen ineinandergeschachtelt. Es folgen also ständig fortlaufend je ein Streifchen Farbauszug Rot, Grün, Blau, Rot, Grün, Blau, Rot usw. Jedes Streifchen ist nur etwa 0,010 mm breit. Die technischen Mittel, mit denen diese erstaunliche Leistung erzielt wird, sind optischer Art. Die Zerlegung des Bildes in die 0,010 mm breiten Farbauszugstreifen bewirkt das auf dem Film selbst angebrachte Linsenraster im Verein mit einem im Objektiv angeordneten Dreizonenfarbfilter. Die Wiedergabe ist die genaue Umkehrung des Aufnahmestrahlenganges. Das heißt, daß auch der Positivfilm ein Linsenraster tragen muß, und daß in das Projektionsobjektiv ebenfalls ein Dreizonenfarbfilter einzusetzen ist. Der Vorteil dieser streifenweisen Anordnung der Farbauszüge ist, daß Deckungsfehler nicht mehr auftreten können; dafür entstehen allerdings Farbsäume, wenn die Bildkonturen zufällig parallel den dem Film aufgeprägten Zylinderlinsen verlaufen. Durch besondere optische Maßnahmen ist dieser Fehler vermeidbar. Auf die Einzelheiten des Siemens-Verfahrens, das praktisch nicht mehr ausgeübt wird, wollen wir nicht näher eingehen; es genügt uns in diesem Zusammenhang, die Grundzüge herauszustellen. Die mit dem Siemens-Verfahren erzielte Farbgüte war bemerkenswert hoch. Dennoch gelangte es nicht zur praktischen Einführung, und zwar mit Rücksicht auf die allzu geringe Bildhelligkeit in der Projektion, die nur etwa den zehnten Teil einer unter gleichen Verhältnissen durchgeführten Schwarzweißprojektion erreichte. Trotzdem bleibt die wissenschaftliche und technische Leistung der Siemens-Laboratorien, in denen dieses Farbfilmverfahren aufs sorgfältigste und umfassend durchgearbeitet wurden, bewundernswert. 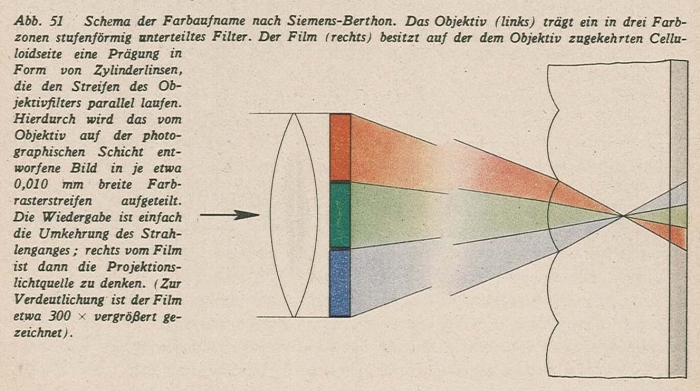 Insofern ist das Siemens-Rasterverfahren ein Schulbeispiel in der Geschichte der Farbfilmtechnik: Man griff auf eine jahrzehntealte Grundidee zurück (die Grundzüge des Verfahrens waren bereits vor dem Weltkriege von Berthon und Keller-Dorian in Frankreich angegeben worden) und erwartete von einer wissenschaftlichen und technischen Ausschöpfung aller Möglichkeiten die Überwindung der im Anfangsstadium aufgetretenen Mängel. Dies gelang auch in einem bemerkenswerten Maß, wobei für das gesamte Farbfilmgebiet wesentliche Erkenntnisse gewonnen wurden. Nur die zu geringe Bildwandhelligkeit ließ sich mit den derzeitigen technischen Mitteln nicht verbessern, und daran mußte schließlich die Einführung des Verfahrens überhaupt scheitern. Die Arbeitsweise dieses Verfahrens geht aus Abb. 48 hervor. Bevor bei der Aufnahme die Lichtstrahlen hinter dem Objektiv die photographische Schicht erreichen, wo sie das Bild des aufzunehmenden Objektes entwerfen, durchsetzen sie ein Farbraster, das unmittelbar im Kontakt mit der lichtempfindlichen Schicht steht. Die Belichtung und spätere Schwärzung der Schicht erfolgt also für jeden Punkt nach Maßgabe der dort wirksam gewesenen Lichtfarbe und der Farbe des Filterfeldchens. Würde z. B. gleichmäßig rotes Licht auftreffen, so wird dieses von den roten Filterstreifen durchgelassen, von den grünen und blauen Filterstückchen dagegen verschluckt werden. Nach der Entwicklung, in diesem Fall einer Umkehrentwicklung, die statt zum Negativ zum Positiv führt, erhält man unter den roten Streifen keine Silberschwärzung, unter den blauen und grünen Filtern dagegen hohe Schwärzungen. Der Film sieht also in der Durchsicht betrachtet gleichmäßig rot aus, da nur die roten Filterstreifen sichtbar sind, während die grünen und blauen Filterstreifen durch die Silberausscheidung verhüllt werden. 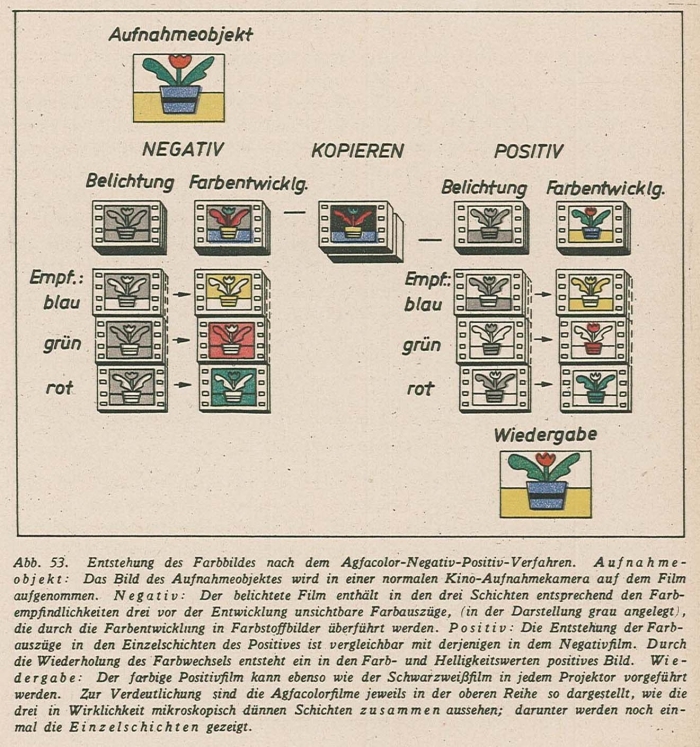 Zu einem gleichartigen Aussehen des Bildes führt im Endresultat auch der Dufaycolor-Negativ-Positiv-Prozeß. Obwohl es sich bei Dufaycolor um ein echtes Farbspaltungs-Aufnahmeverfahren und ein echtes additives Wiedergabeverfahren handelt, erhält man unmittelbar farbige Negative und Positive, was sonst nur bei subtraktiven Verfahren der Fall ist. Der Grund besteht darin, daß bei Dufaycolor die Farbfilter, die immer das Kennzeichen additiver Wiedergabe sind, unmittelbar und unlösbar auf dem Film selbst angebracht sind. Dieser scheinbare Vorteil ist aber auch gleichzeitig die Schwäche des Verfahrens: Die Feinheit des Farbrasters bestimmt die Auflösung und Schärfe des Bildes sowie die Farbgüte. Obwohl die Fabrikation eines derartigen Rasterfilms schwierig genug sein mag, genügt die Feinheit der Striche bei weitem noch nicht. Das Dufaycolor-Verfahren, zu dem der Film seit Jahren von der englischen Filmfabrik Ilford hergestellt wird, ist bis jetzt noch nicht in bedeutende Anwendung gekommen; es ist auch für die Zukunft keine Aussicht dazu. Bei der Wiedergabe besteht, wie bei allen additiven Verfahren, die Schwierigkeit, ausreichende Bildhelligkeit zu erhalten. Davon abgesehen kann der Film wie jeder subtraktive Farbfilm ohne Projektoränderung laufen, da er – wie gesagt – sein Farbfilter gleich mit sich führt. Dem Technicolor-Verfahren kommt von den bisher genannten Farbfilmverfahren allein praktische Bedeutung zu. Die Aufnahme geschieht mit einer Strahlenteilungskamera, in der drei Normalfilme gleichzeitig laufen, und zwar der Grünauszug für sich, der Rot- und Blauauszug im Kontakt als sogenannte Bipackfilme. Es handelt sich also um ein Aufnahmeverfahren mit teilweiser Farbspaltung und -siebung. Die Anordnung entspricht Abb. 44. Nach der Entwicklung werden von den Negativen sogenannte Matrizenfilme hergestellt, das sind Filme, die das Bild in Form eines Gelatinequellreliefs tragen. Die Matrizenfilme können bestimmte Farbstoffe aufnehmen, wobei die Menge des an jeder Stelle aufgenommenen Farbstoffes von dem Quellungszustand der Gelatine abhängt. Der so eingefärbte Matrizenfilm wird auf einen blanken Gelatinefilm umgedruckt: Werden der eingefärbte Matrizenfilm und der Gelatineblankfilm unter bestimmten Voraussetzungen in Kontakt miteinander gebracht, so zieht nach kurzer Zeit der Farbstoff vollständig in den Gelatinefilm ein, es entsteht in ihm also ein Farbstoffbild, das dem Bild auf dem Matrizenfilm aufs genaueste gleicht. Die dem Rot-, Grün- und Blauauszug entsprechenden Matrizenfilme werden nun beim Technicolor-Verfahren nacheinander jeweils mit den zugehörigen Farbstoffen eingefärbt und auf den Gelatineblankfilm umgedruckt, so daß dieser zuletzt in einer Schicht übereinander die drei Farbstoffbilder enthält. Damit ist im Prinzip die Technicolor-Kopie vorführfertig. Praktisch ist die Herstellung komplizierter; so verwendet man z. B. als Film, auf den die Farbstoffbilder umgedruckt werden, keinen Gelatineblankfilm, sondern eine Art von Positivfilm, in dem man zunächst eine sehr kontrastreiche Schwarzweißkopie aus allen drei Teilnegativen erzeugt. Durch dieses Schwarzbild, auch Schlüsselbild genannt, erhöht man die scheinbare Schärfe der nachträglich eingedruckten Farbstoffbilder; außerdem verringert man durch den Schwarzgehalt unliebsame Farbstichigkeiten. Besondere Vorkehrungen sind zu treffen, damit die drei bzw. vier Teilbilder registerhaltig werden, d. h. daß sie keine Farbsäume infolge von Deckungsfehlern aufweisen. Für die Kopienherstellung im großen wurden von Technicolor umfangreiche technische Anlagen in Amerika und England geschaffen. Während einer Reihe von Jahren war Technicolor überhaupt das einzige Verfahren, nach dem große Spielfilme hergestellt werden konnten. Neuerdings ist aber in dem deutschen Agfacolor-Verfahren ein ernsthafter Wettbewerber um den ersten Platz in der Farbfilmtechnik entstanden. Die Wiedergabe bereitet bei Technicolor-Filmen keine Schwierigkeiten. Da der Film selbst ein Farbstoffbild trägt, also farbig ist, braucht an der Vorführmaschine keine Änderung vorgenommen zu werden: Auch die Helligkeit des Projektionsbildes entspricht etwa der des Schwarzweißbildes. 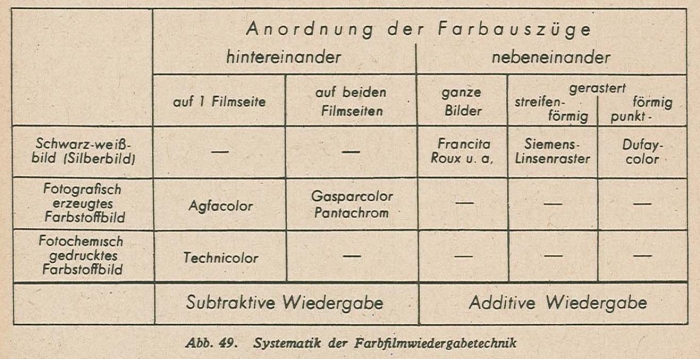 Dieses interessante, vor Jahren von der Agfa entwickelte und beim erfolgreichen Durchsetzen des Agfacolor-Verfahrens wieder verlassene Farbfilmverfahren arbeitet folgendermaßen: Die Aufnahme erfolgt unter zweimaliger Farbspaltung und einmaliger Farbsiebung auf Bipackfilm, von dem der Frontfilm ein Linsenrasterfilm ist. Dieser nimmt den Grün- und Blauauszug auf, der ungerasterte Rückfilm dagegen den Rotauszug. Dementsprechend ist im Aufnahmeobjektiv ein Zonenfarbfilter mit den Farben Purpur (Blau- + Rotdurchlässigkeit) und Gelb (Grün- + Rotdurchlässigkeit) angeordnet. Kopiert wird auf einen Film, der auf der einen Seite zwei übereinandergegossene farbstoffhaltige Bromsilberschichten besitzt, und zwar eine Schicht mit Gelb-, die andere mit Purpurfarbstoff. Der Rotauszug wird auf die einfach begossene Seite kopiert und nach dem Entwickeln in bekannter Weise in ein Eisenblaubild umgewandelt. Der Linsenrasterfilm wird in einer Kontaktkopiermaschine in die Doppelschicht kopiert, und zwar der Blauauszug in die Gelbschicht, der Grünauszug in die Purpurschicht. Im Laufe des Entwicklungsprozesses werden diese Farbstoffe nach Maßgabe des entwickelten Silbers ausgebleicht. Das Verfahren liefert also Kopien für subtraktive Wiedergabe, und zwar von hoher Farbsättigung. Der Nachteil besteht in der Gefahr von Deckungsfehlern beim Kopieren sowie in den Beschränkungen in der Aufnahmeoptik infolge der Verwendung eines Linsenrasterfilms. Obwohl das Verfahren wieder fallen gelassen wurde, ist es für unsere vergleichende Betrachtungsweise von großem Interesse, weil es ein schönes Beispiel dafür ist, wie Aufnahme- und Wiedergabemethoden beliebig koppelbar sind. Hier ist durch eine geschickte Anordnung erreicht worden, daß das Linsenrasterverfahren, das zunächst für die additive Wiedergabe prädestiniert erscheint, dennoch eine subtraktive Farbkopie liefert. Dadurch umging man die Schwierigkeit der zu geringen Bildwandhelligkeit und der Optikänderung des Projektors; angesichts dieser Vorzüge konnte man die Gefahr der Deckungsfehler beim Herstellen der Kopien in Kauf nehmen. Einen Überblick über den gesamten Agfacolor-Prozeß gibt Abb. 53. Die Aufnahme erfolgt auf einem Film, der übereinander die drei Farbauszugsschichten trägt; Agfacolor ist also in der Aufnahme ein reines Farbsiebverfahren. Bei der Entwicklung entstehen primär Silberbilder, aber zugleich auch Farbstoffbilder; die Silberbilder werden entfernt, nur die Farbstoffbilder werden weiter verwendet. In der oberen Schicht ist das Bild aus gelben Farbstoffen aufgebaut, in der mittleren aus purpurfarbenen, in der unteren aus blaugrünen. Zum Kopieren wird ein ebensolcher Dreischichtenfilm verwendet, dementsprechend übertragen sich die Negativfarbauszüge in die ihnen nach Farbempfindlichkeit zugeordneten Schichten des Positivfilms, der nach der Entwicklung ebenfalls unmittelbar ein farbiges Bild liefert. Wir legen an dieser Stelle weniger Wert darauf, daß der Leser diese Vorgänge schon im einzelnen versteht (das werden wir im Dritten Hauptteil nachholen), als darauf, daß er das charakteristische Merkmal des Agfacolor-Verfahrens erfaßt: der Agfacolor-Negativfilm liefert bei der Entwicklung unmittelbar ein farbiges Bild, von dem ohne weiteres auf Agfacolor-Positivfilm eine farbige Kopie hergestellt wird, die für subtraktive Farbwiedergabe geeignet ist. Insoweit hat das Agfacolor-Verfahren eine scheinbare Ähnlichkeit mit dem Dufaycolor-Verfahren, das ebenfalls unmittelbar farbige Negative und ohne weiteres projektionsfähige Positive liefert. 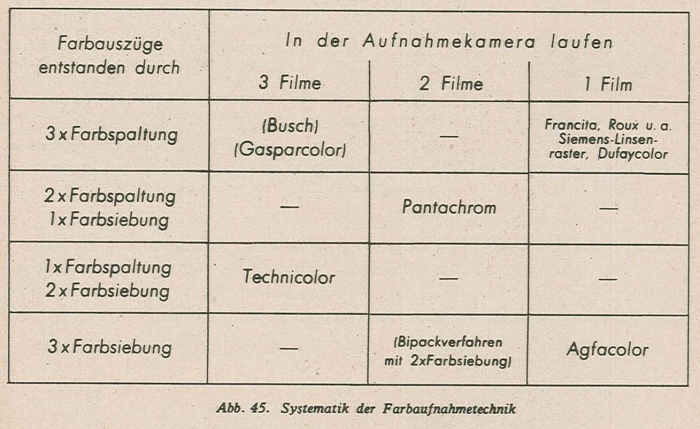 Während aber Dufaycolor sich für die Aufnahme der Farbspaltung bedient, verwendet Agfacolor die Farbsiebung, und während bei Dufaycolor die Wiedergabe additiv erfolgt, geschieht dies bei Agfacolor subtraktiv. Bevor wir diesen Teil des Buches abschließen und uns der speziellen Betrachtung des Agfacolor-Verfahrens zuwenden, wollen wir durch eine kurze vergleichende Betrachtung der hauptsächlichen Farbfilmverfahren eine Nutzanwendung zu ziehen versuchen. Die große praktische Bedeutung einer solchen vergleichenden Gegenüberstellung der hauptsächlichen Farbfilmverfahren besteht darin, daß nur sie die Grundlage für eine objektive Wertung und Abwägung der Aussichten zur Verwirklichung jedes Farbfilm Verfahrens gibt. Insofern ist dieses Kapitel nicht nur für den Techniker, sondern auch für den Geldgeber von neu auszuarbeitenden Farbfilmverfahren bestimmt. und veranschaulichen in Abb. 54, linke Hälfte, für die hauptsächlichen Farbfilmverfahren, wie es mit dem technischen Aufwand in diesen Untergruppen im Vergleich zum Schwarzweißfilm steht. Je höher sich die Fläche über die Grundlinie erhebt, desto größer ist der technische Aufwand einzuschätzen. Es ist klar, daß es sich dabei um eine subjektive Schätzung handelt, die nur eine Vorstellung von der Verteilung der technischen Schwierigkeiten liefern soll. Wir erkennen, daß es alle Variationsmöglichkeiten gibt: Der technische Aufwand kann auf zwei, drei, vier oder alle fünf Untergruppen verteilt sein. Für die Praxis am unangenehmsten ist es, wenn die Wiedergabeeinrichtungen besondere Aufwendungen erfordern, da es sich hier um eine sehr große Zahl von Apparaten, die zu ändern sind, handelt. Die Verfahren, die in Spalte e höheren Aufwand als Schwarzweißfilm verursachen, gehen also von vornherein mit einem Nachteil ins Rennen. Unbeliebt sind auch Änderungen an den Aufnahmeeinrichtungen (Spalte b), weil jede vom Schwarzweißfilm abweichende Konstruktion und Bedienung der Aufnahmekamera eine Erschwerung und Verteuerung des Atelierbetriebs mit sich bringt. Verfahren ohne besondere Ansprüche in dieser Spalte werden sich daher leichter praktisch einführen lassen als die andern. Besondere Maßnahmen in der Kopieranstalt (Spalte c) können dagegen leichter in Kauf genommen werden. Die Kopieranstalt ist ohnehin als technischer Betrieb anzusehen, dem ein erhöhter Aufwand für den Farbfilm schon zugemutet werden kann. Allerdings bedeutet großer Aufwand an dieser Stelle in der Regel auch größeren Zeitbedarf für die Farbfilmherstellung. Dies kann insbesondere den Produktionsablauf eines Farbfilms empfindlich stören, wenn etwa die Musterkopien nicht innerhalb 24 Stunden geliefert werden können. Schließlich bleibt noch übrig, daß die Schwierigkeiten hauptsächlich auf die Rohfilmherstellung verlagert werden (Spalte a und d). Es leuchtet nach dem vorher Gesagten ein, daß dies eine vorzügliche Lösung sein muß; die Untergruppen b und e bleiben gänzlich unbetroffen, die Untergruppe c wird nur mäßig berührt. Vom Standpunkt des anwendenden Filmtechnikers, dessen Aufgabengebiet von der Aufnahme im Atelier bis zur Wiedergabe im Theater reicht, ist es geradezu die Lösung, denn sie verlagert den Hauptteil der Farbfilmschwierigkeiten sozusagen außer Haus. Dies ist auch ökonomisch eine ausgezeichnete Lösung: Jeder Ateliertag kostet Zehntausende von Mark; die paar hundert täglich gedrehten Meter Film stellen also eine äußerst wertvolle Investition dar. Je schwieriger ein Verarbeitungsprozeß ist, desto mehr Fehlerquellen hat er. Muß man also mit dem die Aufnahmen bereits tragenden Film umständlich manipulieren, um zum farbigen Bild zu kommen, so setzt man damit die wertvollen Aufnahmen allen diesen Verarbeitungsfehlerquellen aus. Sind dagegen die technischen Schwierigkeiten der Farbfilmherstellung im wesentlichen bereits bei der Fabrikation des Rohfilms, also noch bevor der Film bebildert wurde, überwunden worden, so verringern sich damit die Fehlerquellen, denen der Film nach der Belichtung ausgesetzt werden muß. Dabei ist vorausgesetzt, daß die bei der Rohfilmherstellung auftretenden Fabrikationsfehler durch eine sorgfältige Kontrolle entdeckt werden können, so daß also ein völlig einwandfreies Filmmaterial zur Aufnahme verwendet wird. Man kann demnach erwarten, daß Farbfilmverfahren, die auf vielen oder sogar allen Teilgebieten der Filmherstellung zusätzliche Schwierigkeiten machen, es schwerer haben werden, sich praktisch durchzusetzen, als solche, die nur wenige Teilgebiete beanspruchen. Diese vergleichende Betrachtung würde unvollständig sein, wenn nicht außer den Schwierigkeiten auch die Ergebnisse der verschiedenen typischen Verfahren untereinander verglichen würden. Für die Bewertung der Ergebnisse haben wir in Abb. 54, rechte Hälfte, drei photographisch besonders wichtige Größen zugrunde gelegt, nämlich die Schärfenzeichnung des projizierten Bildes (Spalte a), das mögliche Auftreten von Deckungsfehlern und Farbsäumen (Spalte b) und die Helligkeit des Projektionsbildes (Spalte c). Die Bewertung dieser drei Größen ist auch hier im Verhältnis zum Schwarzweißfilm angegeben. Das heißt also z. B., daß bei Technicolor die Schärfenzeichnung etwas schlechter ist als beim Schwarzweißfilm, daß ferner die Gefahr der Deckungsfehler vorhanden ist, während die Projektionshelligkeit der vom Schwarzweißfilm gleicht. Dagegen ist z. B. das Francitaverfahren in allen drei Punkten dem Schwarzweißfilm stark unterlegen, wie aus den großen roten Flächen hervorgeht. Das Agfacolorverfahren indessen erreicht in allen drei Bewertungspunkten den Schwarzweißfilm; es zeichnet sich dadurch vor allen anderen Verfahren aus. Abb. 54 stellt eine Art von technischer Bilanz der typischen Farbfilmverfahren dar, wobei die linke Hälfte die Sollseite, nämlich den technischen Aufwand, und die rechte Hälfte die Habenseite, nämlich das technische Ergebnis, bedeutet, und zwar beide im Vergleich zum normalen Schwarzweißverfahren dargestellt. Die Habenseite der Bilanz weist allerdings “rote Zahlen” auf, das heißt, sie ist negativ, sobald die Beurteilungsgrößen von den entsprechenden Schwarzweißwerten überhaupt abweichen. Das ist darin begründet, daß selbstverständlich kein Farbfilm etwa ein helleres Bild oder weniger Deckungsfehler liefern kann als der als Vergleichsbasis dienende Schwarzweißfilm. Aus dieser Bilanz kann man allerlei herauslesen, z. B. daß ein großer Aufwand ein besseres Ergebnis liefert als ein kleiner Aufwand, wie z. B. der Vergleich Agfacolor – Francita zeigt. Dies ist zwar eine Trivialität, dennoch hat sie sich auf dem Farbfilmgebiet hoch nicht allgemein durchgesetzt. Ferner, daß ein großer Aufwand allein noch keinen Erfolg verbürgt, er muß auch an den richtigen Teilgebieten eingesetzt sein (vergleiche Agfacolor – Dufaycolor); ferner, daß die additiven Wiedergabeverfahren (Siemens, Dufay, Francita) sämtlich eine schlechtere Bilanz aufweisen als die subtraktiven Verfahren (Agfacolor, Technicolor, Pantachrom); ferner, daß das Agfacolor-Verfahren unter allen Wettbewerbern weitaus an der Spitze liegt. Es ist selbstverständlich, daß für diese Gegenüberstellung die Bewertung verschiedenartiger Vor- und Nachteile nur qualitativ erfolgen kann. Trotzdem genügt die Genauigkeit der Angaben, um die wesentlichen Unterschiede deutlich aufzuzeigen. Der Leser vermißt vielleicht in Abb. 54 eine Spalte “Güte der Farbwiedergabe”, denn schließlich scheint es das erste Kriterium eines Farbfilmverfahrens zu sein, “wie die Farben kommen”. Tatsächlich jedoch ist dies das unwichtigste Merkmal für eine strenge und objektive Abwägung der Aussichten der verschiedenen Farbverfahren. Mit etwas paradoxer Übertreibung läßt sich behaupten, daß die Farbgüte bei allen Verfahren gleich groß werden kann, wenn nur die für jedes Verfahren spezifischen Arbeitsbedingungen genügend streng gehandhabt werden. Bei einzelnen Verfahren würde dabei allerdings ein in der Praxis undurchführbar hoher technischer Aufwand getrieben werden müssen. Gerade unter der – theoretischen – Voraussetzung gleichwertiger Farbergebnisse bei allen Verfahren erweist sich unsere technische Bilanz als stichhaltig. “Britain’s studio structure was not as vertically integrated as the Hollywood studio system in which the major companies dealt with production, distribution and exhibition. It is possible that the British film industry’s weaker financial base and less vertically integrated structure shifted attention to short filmmaking as a practical, more economical site for experimentation with colour. British studios facing fierce competition from Hollywood were less able to risk finance and reputation on producing expensive colour feature films so it made sense rather to exploit a rich national tradition of innovation in short film-malting, from travelogues to the GPO Film Unit. The full-bodied colours of Technicolor made their version a thing of beauty … Dufaycolor was totally different from that of Technicolor – the bright colours more subdued but the dark tones, particularly the glossiness of the horses, somehow richer. The brilliance of Technicolor may, perhaps, have been preferable for this particular subject, but I have the feeling that for a feature-length film one would prefer the softer, less tiring colours of Dufay. 48 Kinematograph Weekly, 27 May 1937, p. 50. I have been unable to discover information on Kinechrome. 49 The Times, 18 May 1937. 50 F. Watts, ‘They Talk Colour’, Cine-Technician vol. 3 no. 14, March-April 1937-38, p. 194. “Il Francita, sistema additivo in bicromia di invenzione francese brevettato nel 1932, sfrutta il medesimo principio all’epoca impiegato da altri brevetti (tra cui il Gualtierotti e il Cristiani-Mascarini), utilizzando tre selezioni monocromatiche disposte a triangolo nello spazio di un fotogramma standard (fig. 13)83. Il marchio arriva in Italia nel 1937, in seguito all’interessamento di Giovacchino Forzano, che promuove l’unico investimentoproduttivo nazionale sull’invenzione. Forzano progetta di dar vita a una produzione durevole di film a colori attraverso la costituzione della Color Film, che prende il posto della estinta Pisorno Film. Si tratta del primo tentativo di questo tipo inscritto all’interno di una realtà tecnologica ed economica strutturata, quale si presenta in questo periodo l’area produttiva da poco costruita tra Pisa e Livorno. La maggiore stabilità garantita dalla presenza degli stabilimenti spinge Forzano a elaborare una strategia commerciale che guarda al contempo all’interno e all’esterno dei confini nazionali: da una parte, per garantirsi l’importazione di alcuni film a colori stranieri, la Color Film stipula un accordo con la Grand National inglese, di cui distribuisce un gruppo di titoli, tra cui due a colori84; sul fronte interno la società ottiene l’esclusiva italiana per lo sfruttamento del Francita e, dopo l’acquisizione di attrezzature adeguate negli studi toscani, inizia la sperimentazione sul colore85. In breve tempo, tuttavia, le disposizioni sul monopolio e le leggi razziali pongono fine alle ambizioni della società, che annovera tra i propri soci l’ebreo Lodovico Toeplitz. L’azione di Forzano è leggibile come un tentativo di risollevare gli stabilimenti dalla crisi economica in cui stavano lentamente precipitando, nel quadro di un ampio sforzo di emancipazione nei confronti della nascente Cinecittà, che ben presto avrebbe portato via primati e lavorazioni al complesso toscano. L’opposizione di Luigi Freddi al progetto è molto forte; formalmente, essa si ricollega al diniego espresso verso il rappresentate italiano del sistema, tale Philip Marr, che gli uffici di Pubblica Sicurezza descrivono come un filibustiere. Già messo alla porta dai funzionari presso gli uffici romani, il rientro sulla scena del presunto avventuriero in seguito agli accordi stipulati con Forzano fa imbestialire la DGC, che ostacola con i potenti mezzi del suo direttore il decollo del progetto toscano86. Non è facile valutare quanto il veto posto da Freddi su Marr rispondesse ad autentiche motivazioni e quanto non fosse piuttosto un pretesto per ostacolare un’iniziativa rivale, che rischiava di togliere lustro e celebrità alla produzione romana. Ad ogni modo, Forzano è costretto a rivedere al ribasso i piani di lavoro e, a dispetto di qualche annuncio più promettente, la produzione resta limitata a pochi esperimenti girati nel corso del 1937. Anche in questo caso, il prestigio dei soggetti ripresi funge da fattore nobilitante, dalla visita di Mussolini agli stabilimenti agli stendardi e costumi del Palio di Siena87. 83 Benché il nome evochi una collaborazione franco-italiana, questo sistema sembra essere prettamente transalpino; l’unico apporto nazionale ipotizzabile è quello legato al nome di un certo Armeno Secci, titolare del primo brevetto, depositato in Francia nel 1932. Nelle fonti estere, questo oscuro inventore è rimosso in favore di Maurice Velie, designato come ideatore unico del Francita. Alcuni testi accostano il Francita al sistema ideato da Vitale Casiraghi (figg. 18-24). Per la storia e la tecnologia del Francita, cfr. A. Cornwell-Clyne, Colour Cinematography, London, Chapman & Hall, 1936 , pp. 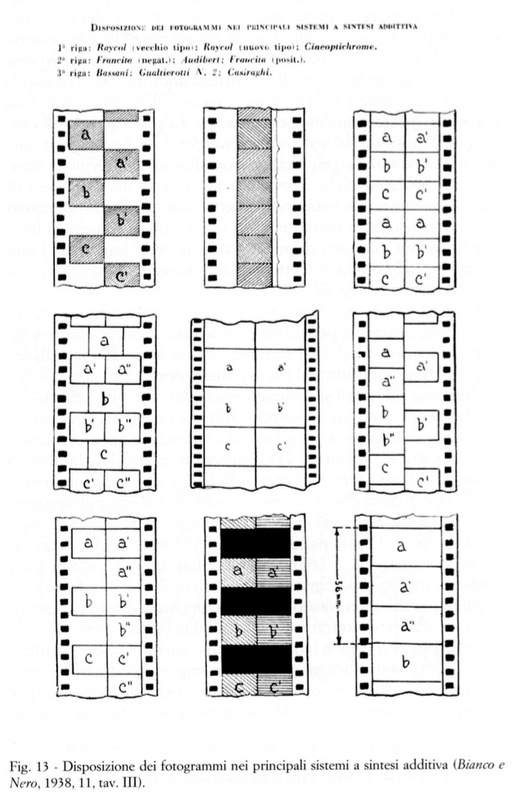 279–280; B. Coe, The History of Movie Photography, London, Ash & Grant, 1981, pp. 122–123. 84 Cfr. “Tirrenia”, in Lo Schermo, 1937, 8, p. 39. La distribuzione del primo gruppo di film della Color Film per la stagione 1937-38 è annunciata da uno spazio pubblicitario in Lo Schermo, 1937, 10, p. 4. 85 In dotazione presso gli stabilimenti si trovano macchine da presa Eclair fabbricate per le riprese a colori con il sistema Francita (cfr. Almanacco del cinema italiano, Società Anonima Editrice Cinema, Roma, 1939, p. 72). 86 Cfr. L. Freddi, Il cinema, Roma, L ‘Arnia, 1949, pp. 347–349. Per la storia degli stabilimenti di Tirrenia, cfr. anche S. Della Croce, “Tirrenia, la prima città del cinema”, in L. Cuccu (a cura di), Il cinema nelle città. Livorno e Pisa nei 100 anni del Cinematografo, Pisa, ETS, 1996, pp. 159–189.